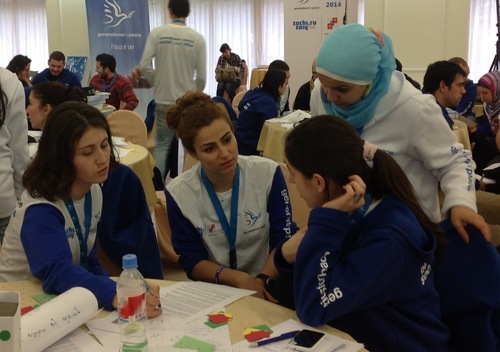 The morning of Sochi Camp 2014 Day Five included an introduction to Generations For Peace Events; in particular Sport For Peace Events and Advocacy For Peace Events. Events are intended to increase awareness and generate interest in Generations For Peace as an organisation and GFP programmes more generally. They also serve to attract volunteers, potential partners and stakeholders. Each of these trainings integrate peace-building education for conflict transformation objectives, with a specific GFP Vehicle for Peace Building. (ex. A SPT would be held to prepare volunteers to assist with a Sport For Peace Programme). The TTT is unique to the other trainings, as it provides knowledge in adult learning and the skills to help volunteers train other trainers. The TTT component can be combined with one or more of the above trainings, depending on the focus for the desired ongoing activities. The Delegates should now be familiar with Generations For Peace Events and Generations For Peace Trainings. Tune in to the blog tomorrow for a discussion on GFP Ongoing Activities.